Provides a clear look at spiritual activism and the ways it can help us to be better activists, better leaders, and more comfortable with our own spiritualityOver the past half century, our understanding and awareness of spirituality has changed in nature, as have the issues facing activists. Spirituality is rising up the agenda for activists because it offers distinct, tried and tested approaches to deep questions such as Where did it all go wrong? What does it mean to be human? What is the place of leadership? What is the nature of power? This book starts from scratch, defining spirituality for a generation sometimes dazzled by the claims of materialism. Where others attempt to distinguish science and religion, Spiritual Activism instead contrasts spirituality and materialism. 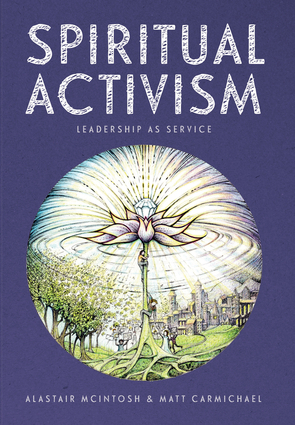 The text is peppered with tales from the authors' activist experience and includes case studies of inspirational spiritual activists that demonstrate the transformative power of spiritual principles in action. Alastair McIntosh is a Scottish writer, scholar, broadcaster, and activist on social, environmental, and spiritual issues. He is a fellow of the Centre for Human Ecology, an honorary fellow in the School of Divinity at Edinburgh University, and an honorary senior research fellow in the College of Social Sciences at Glasgow University. He has written numerous books, including Hell and High Water: Climate Change, Hope and the Human Condition; Radical Human Ecology; and Soil and Soul: People versus Corporate Power. Matt Carmichael is a climate activist, English teacher, and writer. He was a founder board member of Schumacher North, a forum devoted to exploring and promoting the ideas of deep ecology, sustainable development, and social transformation, and is the creator of the Delta Course, an intensive course on spirituality for groups of people from any or no religious background.